Appearance: The breed is large framed with a square outline of the head, large ears, broad chest, solid bone structure, a long, hard muscled, rectangular body and a long flowing tail. Good muscle tone and density give the cat the appearance of power and robustness. 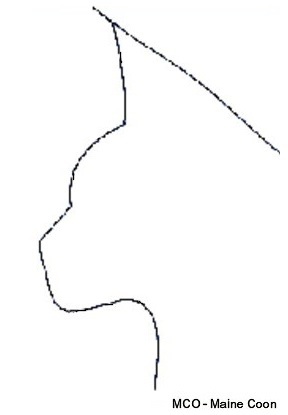 Face-Nose-Muzzle: Face and nose of medium length with a square outline of the muzzle. Distinct transition can be felt between muzzle and cheekbones. Shape: Large, wide at the base. Moderately pointed. Lynx-tufts are desireable. Tufts of hair in the ears extend beyond outer edges of ears. Placement: Set high on head with a very sligth outward tilt. Ears should be placed one ear’s width apart. The width extends slightly in older cats. Lower base set just slightly further back than upper base. Shape: Large and widely set. Slightly oval, but not almond shaped, appear round when wide open. Set slightly slantet towards the outer base of the ear. Colour: Any colour is permitted. There is no relationship between eye- and coat colour. Clear eye colour is desireable. Structure: The body should be long, substantial bone structure. Hard muscled, powerful, broad chested. Large framed, all parts of the body in proportion to create a rectangular appearance. At least as long as the body from shoulderblade to base of tail. Wide at the base tapering to the tip, with full, flowing hair. The hair on the tail is long and always remains flowing. Structure: All weather coat. Dense. Short on head, shoulders and legs, becoming gradually longer down the back and sides, with long, full shaggy baggy trousers on the hind legs and belly fur. A frill is expected. Silky texture. Coat has distinct body, falling smoothly. The undercoat is soft and fine, covered by the coarse smooth outercoat. Colour: All colour varieties are permitted, including all colour varieties with white; except pointed patterns and chocolate, lilac, cinnamon and fawn. Any amount of white is allowed, i.e a white blaze, white locket, white on the belly, white on the paws etc.